I have a couple of things to share with you. The first one you can pass along. The second one you must keep as a secret. 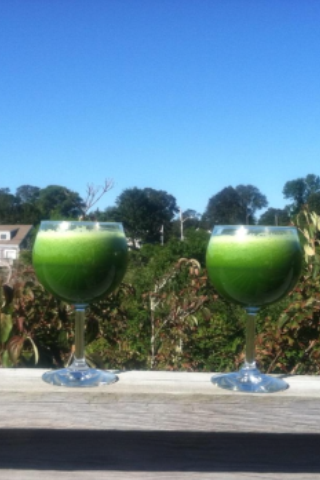 3 huge handfuls of kale :: 4 romaine leaves :: 3-4 stalks celery :: slice of ginger :: 1 whole peeled cucumber :: 1 pear. Add the cucumber last. It adds all the water. Sometimes she likes to add a kiwi for a little extra zing. Yummo! So, make some lounge pants in a washable linen. Use the salvage edge as the bottom. It's all frayed and cool. And call it a pair of linen pants. Done. Finished. Easy peasy. Super comfy. I could go for a drink right now!! I want a pair. Extra large for good lounging. You gals are so cute together! haha love it! will be trying that drink this weekend... and to live in lounge pants is a daily goal of mine! you girls rock it. ps...still LOVING those placemat boards - the boys enjoy them lots! You two gals are so cute!!! I love that pattern so much - I've made my mom 2 pairs in washable linen - they are so comfy. I still haven't made any from sheets (what's the matter with me?) but I have made a skirt and a sundress from pillowcases - you must try it! Thanks so much for sharing Lisa's smoothie receipe - I was going to ask for it! I've got a green one too that is very similar (uses strawberries instead of cucumber and doesn't have any celery). I can't wait to try this one! What a hoot! Gorgeous though :) I'm laughing at the description of your horrified kids! Those pants look wonderful...comfy, soft, and pretty. You are pretty ladies! Looks like you had a blast! I am pretty sure you two cannot get any cuter! !.......or healthier! You are so hip. Love the pants! I have a pair of linen drawstring pants I scooped up at Target on clearance and I love them so much that I want more. This fits the bill perfectly. Thank you, Leslie! i have made quite a few pairs of these....love them and i have a few pairs that go out and about to lounge! I really love that picture of your sister and you on the beach. No worries, my lips are sealed! those pants are awesome! and i am going to have to make that drink. Oh man...I am jonesin for a pair of lounge pants now! Thanks so much for the idea and for the liquid sunshine recipe. Sounds delicious and I bet you feel like a million bucks after drinking it! Those are great. Who cares what the kids think. Made the juice for dinner tonight with omelettes-- totally rescued me from feeling like the nutritionally lamest mom ever. My Laurel came back for a THIRD glass. Yum.